Turn an everyday thoroughfare into a home highlight for an arrival that will not go unnoticed. – Painting a doorway (arched or rectangular) is an elegant way to add detail to a simple space — and it’s as easy as pie. This works best in a room that’s painted a pale colour because it ensures a bold contrast (or vice versa). – You might like to let your Resene paint choices be informed by hero homeware items or artwork in the room. Our palette was inspired by the velvet of the chair and the tiled top of the console table in the hallway. 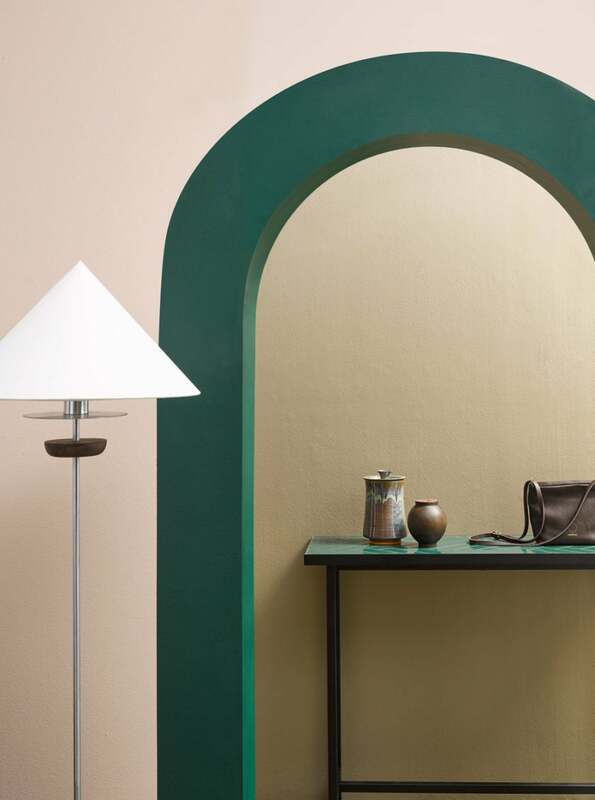 – Mask and paint an 18cm band around the door frame, then paint the interior of the frame the same shade. We continued the band around the room to create a skirting-board effect. – Now’s a fine opportunity to also make yourself a new object of interest. 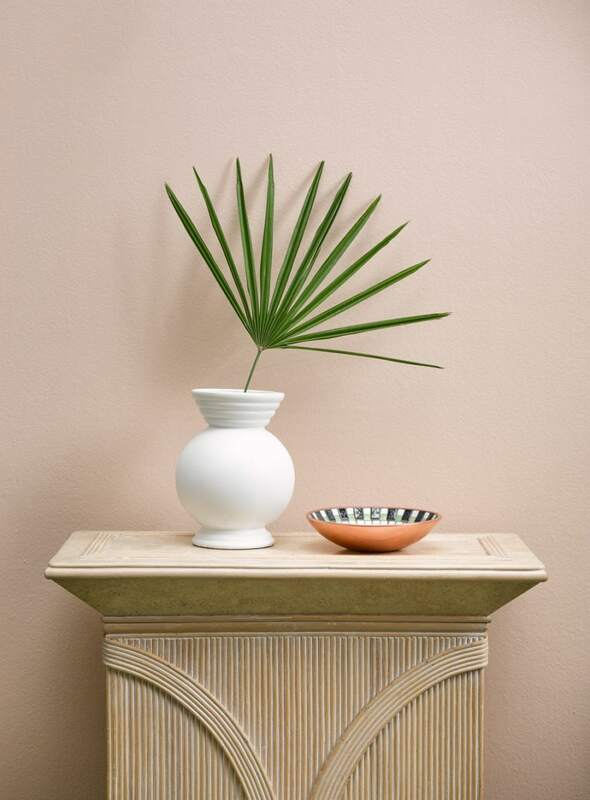 Keep an eye out in op shops for an intriguingly shaped vase, then use a Resene testpot in a favourite shade to instantly bring it up to date, like we did, below. BACKDROP Living area wall in Resene SpaceCote Low Sheen in Resene Shabby Chic; hallway wall Resene SpaceCote Low Sheen in Resene Earthen; archway in Resene Family Tree; floor in Resene Enamacryl gloss in Resene Waiouru, resene.co.nz. 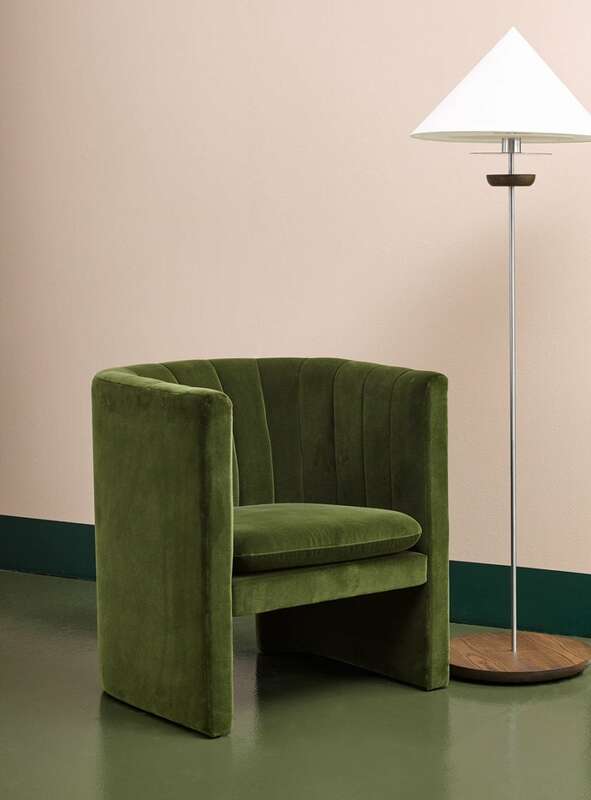 MAIN IMAGE, FROM LEFT Loafer lounge chair by Space Copenhagen for &tradition, $4359, dawsonandco.nz. Turn floor lamp, $1330, douglasandbec.com. Herringbone Tile console table by Charlotte Høncke for Warm Nordic, $1995, goodform.co.nz. Ceramic container by Artesanía de Galicia, $159; Moon jar by Walk in the Park, $253, tessuti.co.nz. Ada bag, $330, georgiajay.com. Pedestal, $400, babelogue.shop. Vintage vase in Resene Rice Cake, resene.co.nz. Mosaic Tile dish by John Crichton, $550, mrbigglesworthy.co.nz. PAINT SWATCHES, FROM LEFT Resene Shabby Chic, Resene Family Tree, Resene Earthen, Resene Waiouru, Resene Rice Cake, resene.co.nz. The post Make an entrance appeared first on homestyle.